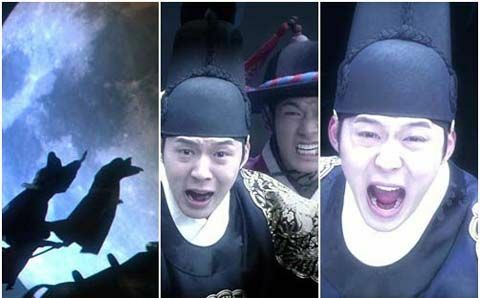 SBS TV Wednesday and Thursday drama series Rooftop Prince officially debuted on march 21st, 2012, the content of JYJ member Micky Yoochun who plays the role of crown prince time traveling to come to modern era attracted many viewers. Crown prince Lee Gak played by Park Yoochun gathers a group of people to discuss about the murder of crown princess, and in the end, the 6h grade clerical officer in military education office Song Man Bo (Lee Min Ho), Do Chi San (Choi Woo Sik) who disguised as prostitute and Woo Yong Sul (Jung Suk Won) who has superior martial arts skills but is about to be executed after committed capital offense, are selected as the member of investigation group. But the murder of crown princess is not as simple as one thought. In the end all the leads were cut off, although the suspect was captured, but he was killed to silent. Later Do Chi San discovers new clue, and the group goes to forest, but a group of killers are waiting for them. Then an inexplicable power brings them to the sky, beyond time and space to come to the home of modern era Park Ha (played by Han Ji Min). Park Ha is shocked at the sudden appearance of the 4 persons, while the 4 persons think Park Ha is assassin, and pull out the sword. What will happen between the 4 persons who come from ancient times and modern Park Ha is raising audience expectations.